Today a soup that I discovered accidentally. 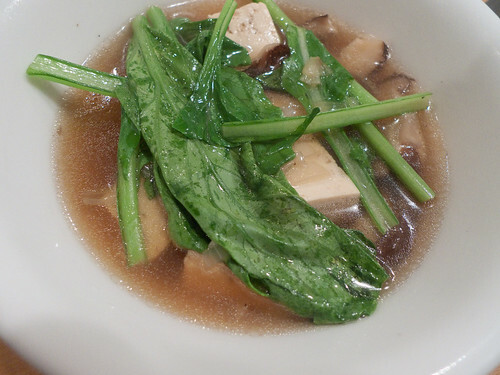 It’s influenced by a lot of Chinese and Japanese style soups that I have consumed over the years, but I can’t claim that it actually has any real authentic connection to those cuisines. I threw this together one night in a miracle after a late day at work. So here we go. First, buy a two or three pound package of chicken wings. Then cut up 2 onions, 2 or 3 carrots, and 2 or 3 stalks of celery. Put all this in a pot, cover with water, add salt, pepper, and bay leaves. Turn the heat on until you get a simmer. Now play Halo for 3 or 4 hours. If you are industrious, you can saute the vegetables before adding the wings and the water. You can also hack the wings in half. But these are both extra work and not really needed. If you want the broth to be more Chinese style, leave out the carrots and some of the celery. Add green onions and ginger. So there you go. When the broth is done, let it sit in the fridge for a day or two and skim the fat off if you can. I also bought a couple handfuls of Shitake mushrooms. 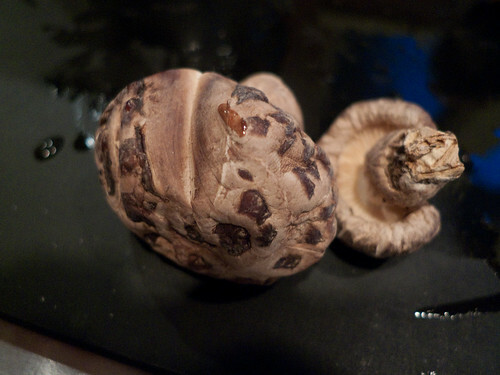 Take two handfuls of the dried mushrooms and put them in a bowl of water. Soak for a few hours to a whole day. It doesn’t seem to matter. 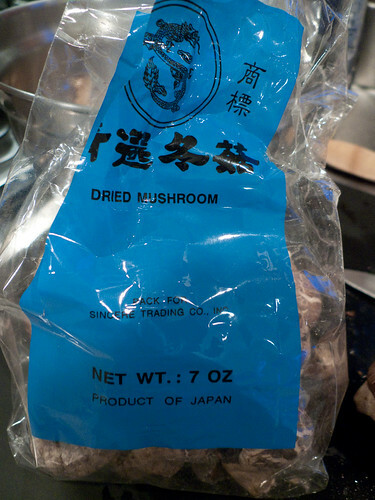 When the dried mushrooms are all soaked, save some of the mushroom water. 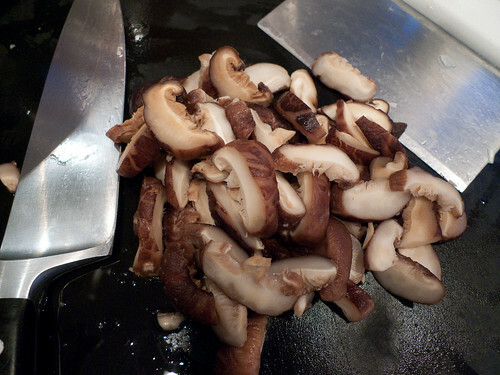 Cut all the dried and fresh mushrooms into little pieces and put them in a bowl. Make sure you cut off and throw away the stems. You can’t actually eat them, which I found out the first time I made this. If you are into that sort of thing cut up a cake or two of tofu too. It’s best to use fresh stuff (you can get fresh at Lotus in Pittsburgh on weekends, for example). Most of the packaged stuff is crap. Get the softest you can. The last thing you’ll need is a diced onion and about five or six large slices of ginger. After you have gathered all your stuff, heat up a big soup pot and put a couple of teaspoons of olive oil into it. Using enough oil is important because it will carry some of the flavor. Add the onion and stir it around a few times. Add salt and pepper. Then add the ginger and toss the whole thing around some more. Reduce the heat and cook the onions and ginger until the onions are soft. Do not get impatient, do this for at least ten minutes. When that’s all set, add the mushrooms. You might need some more oil at this point. Salt and pepper the whole mess and sauté the mushrooms for another five or ten minutes. When you are happy with how things are, add a cup or so of the mushroom water and let it come to a boil. Then add a total of three to four quarts of chicken stock. You want to use enough liquid to balance the solids. Also, if your stock is particularly rich, cutting it half and half with water is a good idea. So, I use maybe two quarts of stock and two quarts of water. But you can figure out what you like. Add some salt and pepper to rebalance the seasoning. Then add a few tablespoons of white wine and a tablespoon or two of soy sauce. Stir, bring to a boil and then simmer twenty minutes to half an hour. I also like to have soup with rice in it, like they do with gumbo. But most people think that’s weird. When you get this correctly balanced, people will think you are a genius, which isn’t really fair since it takes so little work. But that’s the best kind of dish for me. Oh. Fish the big pieces of ginger out of the soup before you serve it. You don’t want some poor unsuspecting child chewing it by accident.